Empress Marie Feodorovna (née Princess Dagmar of Denmark) was the wife of Alexander III of Russia. 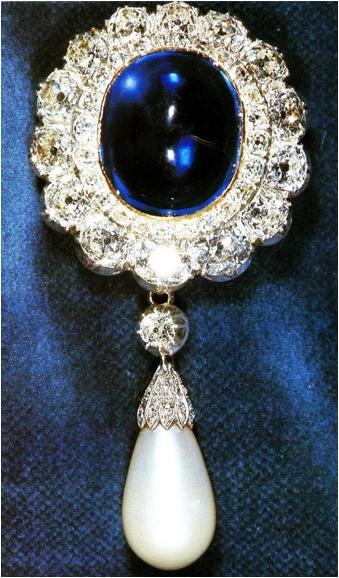 She received this brooch, an oval cabochon sapphire surrounded by two rows of diamonds with a pear drop pearl pendant, as a wedding gift in 1866 from her sister and brother-in-law, the Prince and Princess of Wales (the future King Edward VII and Queen Alexandra). It was one of the jewels that made it out when the Dowager Empress fled revolutionary Russia, but it wasn't to stay in Russian hands for long. 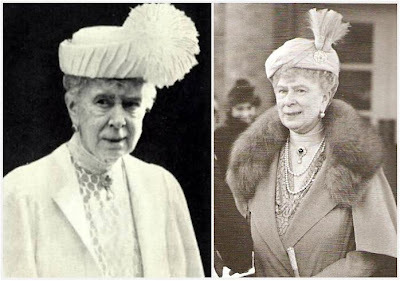 Following her death many of her jewels were sold by her daughters, Grand Duchesses Xenia and Olga. 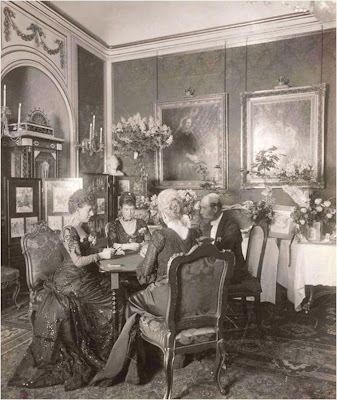 The sale was aided by King George V and Queen Mary (and has been the source of much confusion ever since, often painting George and Mary in a poor light), and Mary purchased some of the items. Given her love of and zeal to preserve family history, Queen Mary must have felt a special draw to the brooch her late parents-in-law once gifted her husband's aunt, and she bought it in 1930. Records from the sale brokered by Hennell's show that the brooch's estimated value had originally been £2,700-£3,250; however, by the time Mary purchased it the market had taken a downturn, and the estimate dropped to £1,400-£1,900. She paid £2,375 for the brooch, over the estimated value. It was among the pieces remaining in Mary's jewel collection at the time of her death in 1953, and was inherited by the Queen along with the rest. She has worn it without the pearl pendant, though she primarily wears it in its full form. It's a jewel I'd love to see more of - it's so lovely I just wish it were more of a favorite.